On An Overgrown Path: When will we reach the Tippett point? When will we reach the Tippett point? Discussions of neglected symphonists invariably neglect to mention Michael Tippett. So it is good to see that Hyperion are releasing Martyn Brabbins conducting the BBC Scottish Symphony Orchestra in Tippett's First and Second Symphonies - sample here - as the first instalment of a Tippett symphony cycle. Excellent accounts by Colin Davis and Richard Hickox failed to persuade the wider audience of the indisputable merit of Tippett's symphonies, so it will be interesting to see how the new Hyperion release fares. The problem is that unfamiliar works such as these require repeated concert hall outings to engage audiences, not the one-off pseudo-event treatment that is now standard for non-mainstream repertoire. To treat Tippett and his neglected peers as more than a solitary freak show requires courage and commitment from conductor, orchestra and promoter. So I'm not holding my breath. Colin Davis' recordings for Argo of Tippett's First and Second Symphonies are my preferred versions. But every time I play the LP seen above I am bemused by the typography, particularly the L.S.O. abbreviation and the omission of the composers first first name. I was playing in the Boston Symphony violin section when it presented the premiere of Tippett's The Mask of Time. Tippett was present, casting an interesting visage, wearing summertime dress and sandals in staid Symphony Hall accompanied by an apparently close companion. The music struck me as diffuse, but what did I know, particularly at that early point in my less than illustrious career. What makes Tippet memorable for me now is Ken Russell's affable and telling criticism of Tippett in his memorable documentary "ABC of British Music" where he chides the composer for his posturing through the employ of fake jazz in the 2nd Symphony. Russell goes on to laud Tippett for his direct and clear message in the Concerto for Double String Orchestra. I can't say that I disagree. Ultimately, I think Tippet may be one of those highly skilled and even great composers like Myaskovsky that require more personal attention from listeners to truly appreciate than they are ever likely to get. Though the BSO was rather good to Tippet (it also presented one of the early performances of The Rose Lake), he is rarely heard over here now. Many thanks for drawing your readers' attention to the first release in this exciting new series of recordings of the Tippett symphonies - exciting because a later instalment will finally let us hear the early symphony Tippett withdrew, but above all for the terrific quality of the interpretations (to judge by the performances already broadcast by Radio 3 - I caught a recent second broadcast of the first symphony and was once again spellbound by it, the sublimely beautiful string writing in the trio of the scherzo just one of the details whose force I had forgotten). It's lucky that I was too busy to comment earlier, because while awed by the musical abilities of a BSO violinist I must take issue with JMW. To begin with there is no fake jazz in the second symphony - I assume Russell must have been talking of the third, where Tippett certainly went out on a limb, trusting his instincts and juxtaposing fragments of Beethoven's 9th with his own version of the blues. The wrong soloist can wreck this, but get it right and (to my mind) it works totally - indeed very tellingly, Tippett's often criticised words for the songs also still sounding strong and powerful. As for the second symphony - where I second your enthusiasm for Colin Davis's revelatory recording - I once deliberately played this disc immediately after Kleiber's Beethoven 5th and felt it stood its ground perfectly, one of the few symphonies with an energy and a density of invention comparable to Beethoven. The pounding Vivaldian Cs and the harmonic tension above certainly launch the piece with terrific energy, but it is with the slow movement that it moves into totally unknown territory: new combinations of instrumental colours and textures, a disjunct language that no one had heard before which has us one moment drifting through far off galaxies and the next having our human hearts tugged by string writing or clouds of horns which somehow evoke emotional states with a directness and precision that no words can explain. And how many finales start with such a kick of fresh, invigorating energy? I hope that the reason Tippett isn't mentioned in discussions of 'neglected symphonists' is that there are still conductors (Knussen as well as Brabbins) and programmers who keep faith with him and keep his music, albeit occasionally, before the public - in the UK at least. When played as powerfully as in performances led by Brabbins or Knussen, or for example by the Birmingham Opera Company, the reaction is usually overwhelming. "I’m just going to say it: The Ice Break is a masterpiece and this production ... the greatest thing that Birmingham Opera Company has yet done" and I'm sure more of the same in response to this new series of recordings of the symphonies. Personally Tippett's Second far outdoes the two Stravinsky symphonies for me as something to be enjoyed. King Priam on the other hand, something to be endured. Better as a play perhaps without the so called "accompanying sounds." dm, I totally agree. 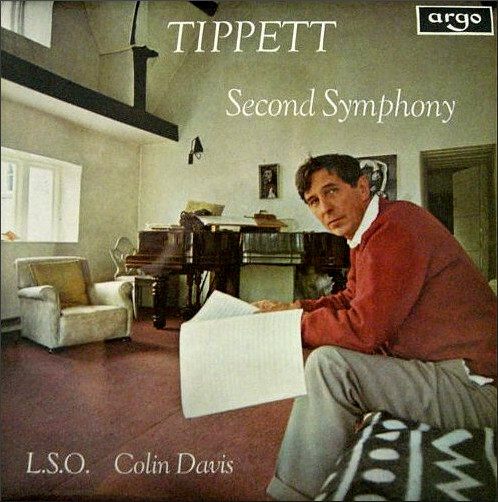 The neglect of Tippett's Second Symphony both in the concert hall and on record has always puzzled me. As an example it has only been played five times at the BBC Proms.